Vistnyk, journal («Вістник»; Herald). 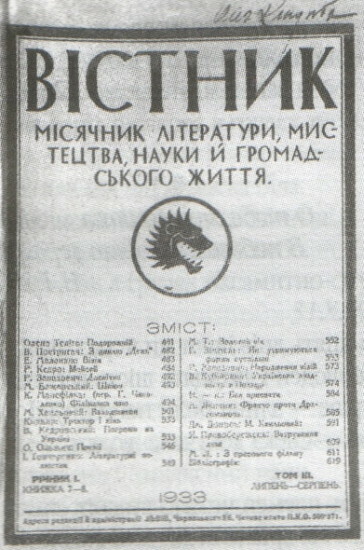 A monthly journal of politics, literature, culture, scholarship, and community affairs published in Lviv in 1933–9 as the continuation of Literaturno-naukovyi vistnyk. Under Dmytro Dontsov, its publisher and chief editor, Vistnyk became one of the most influential journals in Western Ukraine, especially among students and young adults. It propagated a militant nationalist ideology, advocating the ‘national-political slogans of the new Europe and the psychological rebirth of the nation,’ and strongly condemned Marxism, communism, the Soviet Union, freemasonry, Russophiles, and even Ukrainian liberal-democrats and socialists. Articles, prose, and poetry were contributed by many prominent Western Ukrainian and émigré writers and publicists. Vistnyk attracted 1,500 subscribers. From 1934 it published a separate quarterly book series, with pressruns of up to 5,000 copies, featuring works by Dontsov and biographies of European nationalist and fascist leaders. The journal ceased publication in September 1939 with Dontsov's arrest by the Polish authorities.